WinRAR 5 is a powerful archive manager (Windows, Linux, Mac). This is a powerful compression tool with many integrated additional functions to help you organize your compressed archives. It can backup your data and reduce size of email attachments, decompress RAR, ZIP and other files downloaded from Internet and create new archives in RAR and ZIP file format. The archiver puts you ahead of the crowd when it comes to compression. By consistently creating smaller archives, WinRAR is often faster than the competition. This will save you disc space, transmission costs AND valuable working time as well. WinRAR is ideal for multimedia files. It automatically recognizes and selects the best compression method. • Using WinRAR puts you ahead of the crowd when it comes to compression by consistently making smaller archives than the competition, saving disk space and transmission costs. • The program provides complete support for RAR and ZIP archives and is able to unpack CAB, ARJ, LZH, TAR, GZ, ACE, UUE, BZ2, JAR, ISO, 7Z, Z archives. • WinRAR offers a graphic interactive interface utilizing mouse and menus as well as the command line interface. 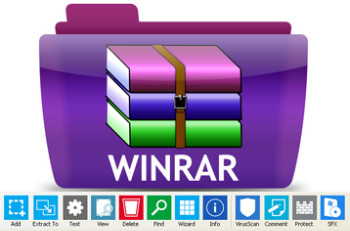 • WinRAR is easier to use than many other archivers with the inclusion of a special “Wizard” mode which allows instant access to the basic archiving functions through a simple question and answer procedure. This avoids confusion in the early stages of use. • WinRAR offers you the benefit of industry strength archive encryption using AES (Advanced Encryption Standard) with a key of 128 bits. • WinRAR supports files and archives up to 8,589 billion gigabytes in size. The number of archived files is, for all practical purposes, unlimited. • WinRAR offers the ability to create selfextracting and multivolume archives. • WinRAR features are constantly being developed to keep WinRAR ahead of the pack. 1. “Files to process” option on “Time” page of archiving dialog allows to choose files based on modification, creation or last access file time. Previously it was possible for modification time only. 2. Command line -ta, -tb, -tn, -to switches accept ‘m’, ‘c’ and ‘a’ modifiers after the switch name. So file time conditions can include not only the file modification time as in previous versions, but also creation and last access time. Such switch can include multiple modifiers to set the same date for all specified times. For example, -tamc20190215 will process files modified and created after 2019-02-15. Switches -ta and -tn also include files matching the specified date exactly. Switches -tb and -to exclude such files. enabled in “Select file list columns” dialog. This dialog is opened after right clicking on file list column headers or after pressing “File list/Files/Columns…” button in WinRAR settings. 4. “Double extensions for archives” and “Archives in subfolders” options on “Files” page of archiving dialog modify behavior of “Put each file to separate archive” option. You can switch between archive names in filename.ext.rar and filename.rar style with “Double extensions for archives”. You can create a separate archive for every file in selected subfolders or store the entire contents of every selected folder in separate archive depending on the state of “Archives in subfolders” option. 5. New -ad1 switch can be used when unpacking multiple archives recursively, such as ‘rar x -r -ad1 arc\*.rar’. It creates a separate folder for files unpacked from each archive, but unlike already existing -ad switch, it creates such folders in each archive folder. subfolders with unpacked files are created in each archive folder. Previous versions created them all in a folder of right clicked archive. 7. New “File list/List style/Checkboxes” option in WinRAR settings allows to use checkboxes to select file list items. 8. New “File list/Files/Exact sizes” option in WinRAR settings. If this option is on, file sizes are always displayed in bytes. If it is off, sizes are rounded up and use units such as KB or MB. Smaller files can be still displayed in bytes. 9. If several console RAR are started with -ioff switch, PC is turned off by RAR copy finished last. Previously this switch was processed by first finished copy. 10. Read and write buffer size is increased for .iso files. It can help to improve .iso extraction performance in some cases, such as for network drives. REV volumes as well. Previously only RAR volumes were deleted keeping REV files intact. 12. If “Delete archive” option in extraction dialog is applied to set of ZIP volumes with .zip.001, .zip.002, .zip.003 extensions, WinRAR will delete all ZIP volumes. Previously only .zip.001 volume was deleted for such volume naming scheme. 13. If we unpack arcname.rar using “Extract to arcname\” Explorer context menu command and “arcname” file already exists, WinRAR shell extension will propose “Extract to arcname~1\” instead. Previously this context menu command attempted to create a folder with same name as already existing file and failed. 14. If we pack a shortcut file with .lnk extension from Explorer context menu, .lnk file itself is added to archive. Previous versions added .lnk file target instead of .lnk file. 15. Windows does not allow executables exceeding 4 GB, so WinRAR issues an error immediately when attempting to create 4 GB or larger RAR SFX volumes. Previously WinRAR issued such error only after creating the first RAR volume. 16. Total extraction progress is displayed for 7z multivolume archives. Accuracy of 7z total extraction progress is improved. 17. “Find” command “Disks and folders” drop down list has been renamed to “Search area”. Additionally to already existing choices, it includes a new “Selected items” option restricting search to files and folders selected in WinRAR file list. 18. “Find” command displays the number of found items in status bar. 19. “Diagnostic messages” window displays archive names in a separate column to provide the better message visibility for lengthy archive names. 20. Switch -isnd[-] in command line WinRAR mode allows to override “Enable sound” option in WinRAR settings. Use -isnd to turn sound notifications on and -isnd- to turn them off. 21. Nadav Grossman from Check Point Software Technologies informed us about a security vulnerability in UNACEV2.DLL library. Aforementioned vulnerability makes possible to create files in arbitrary folders inside or outside of destination folder when unpacking ACE archives. WinRAR used this third party library to unpack ACE archives. UNACEV2.DLL had not been updated since 2005 and we do not have access to its source code. So we decided to drop ACE archive format support to protect security of WinRAR users.